Quit claim deeds are used to transfer ownership of real estate between two parties. You can download our free quit claim deed sample form instantly today below. Quit claim deeds are most commonly used to assign ownership of property when the property is gifted. For example, parents often elect to use a quit claim deed to give property to children. Quit claim deeds are commonly used by family members to transfer real estate when warranty deeds are not needed. Once signed, witnessed and sealed, a quit claim deed gives the grantor the right “quit” his or her interest in the property, thus transferring ownership in the property to the grantee. Whether it’s called a quit claim deed, quitclaim deed or quick claim deed, it does the same thing. To prepare your quit claim deed, date the form and fill in the grantor and grantee section and enter the address and a full description of the property to be transferred. 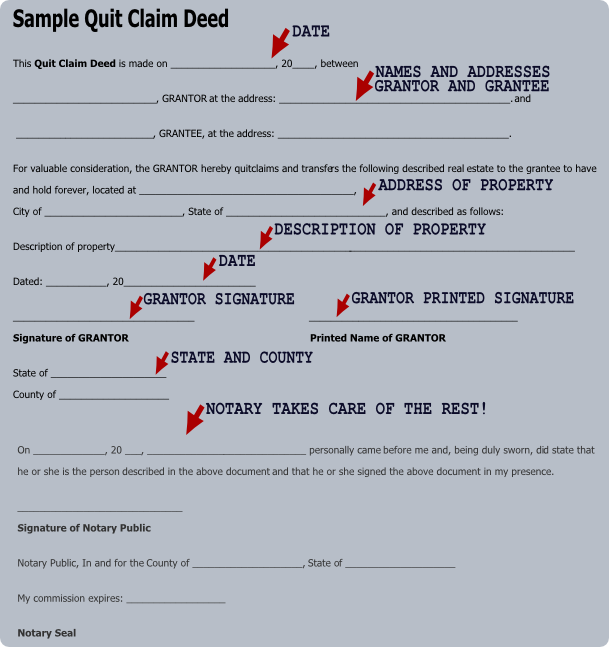 Next, the grantor takes the deed to a notary to sign and seal it. Once notarized, your quit claim deed should be taken to the county clerk’s office to be filed. To file a quit claim deed, take the original deed to your courthouse and go to the county clerk’s office. It could also be called the county recorder or deed registry office – it’s wherever the land records are kept in your county. For a small fee, the county clerk will make a copy of your quit claim deed form and sign, stamp and date the two deeds. The clerk will then give the original back to you and file the copy in the local land records to record the deed. Fill out and print a free quit claim deed form online fast.